The Red Sox cruised to an MLB-leading 108 wins in 2018 on the back of a dynamic duo both at the plate (Mookie Betts, J.D. Martinez) and on the mound (Chris Sale, David Price). Can they keep it up in the playoffs? After cruising to their third straight AL East division title and the best record in baseball, the Red Sox enter the playoffs looking to avenge ALDS elimination in each of the last two seasons and return to the World Series for the first time since 2013. Thanks to the highest-scoring offense in the game and a rotation with two aces, Boston romped through the AL to finish with an MLB-leading 108 wins, the most in franchise history and in the majors since the 2001 Mariners. By that measure, at least, the Red Sox were baseball’s No. 1 team, and they have the numbers to back that up. That league-best lineup is paced by two of the game’s best hitters. Mookie Betts, the likely AL MVP, hit a preposterous .346/.438/.640 with 32 homers and 30 steals; he’s the first-ever member of the 30/30 club to win a batting title. He’s backed by J.D. Martinez, whose 2018 campaign—a .330 batting average, 43 homers and 130 RBIs—is earning him MVP honors in 1988. Xander Bogaerts (a 132 OPS+) and Andrew Benintendi (122) round out a truly fearsome top of the order that can quickly bury an opposing pitcher. There’s more to Boston than just offense, though. On the mound for ALDS Game 1 will be Chris Sale, who posted a 2.11 ERA and 237 strikeouts in 158 innings. Game 2 will belong to David Price, who punched out 177 in 176 frames en route to a 3.58 ERA and 122 ERA+. That imposing tandem, like Betts and Martinez offensively, is tough to beat. And to finish games off, enjoy a dose of Craig Kimbrel and his 13.6 strikeouts per nine. Few postseason teams have superstars quite like the Sox. Those 108 wins cover up some potentially fatal flaws. The biggest concern for Boston has to be Sale, who pitched just 29 innings after the All-Star break due to a shoulder strain and whose velocity was significantly down in his final start of the year. Without him at 100%, it’s hard to imagine the Red Sox lasting long against the brutal lineups of the Yankees, Astros, Indians or A’s. The rotation behind Sale isn’t particularly strong right now either. Price’s 2018 hasn’t been an up-and-down mystery like the season prior, but he enters the postseason unsteady of late (seven runs allowed in his last two starts) and with a nasty history of October disasters (a 5.03 ERA in 73 1/3 career playoff innings). Rick Porcello has been hammered since the All-Star break, with a 4.67 ERA in the second half, and fourth starter Nate Eovaldi may be good for no more than four innings at a time. Boston’s bullpen is equally worrisome: Beyond Kimbrel and setup man Matt Barnes, manager Alex Cora has yet to find a reliever he can trust to handle the late innings. The lineup, meanwhile, is top heavy. The team is getting little offensively around the infield, save Bogaerts, with Boston catchers Sandy Leon and Christian Vazquez producing some truly putrid numbers (a 39—yes, 39—OPS+ for Leon, a 46 OPS+ for Vazquez). The pressure will be on Betts, Martinez, Bogaerts and the slightly slumping Benintendi to do most of the damage. Depending on the health of Eduardo Nuñez, Devers could find himself getting some major run at third base throughout the playoffs. 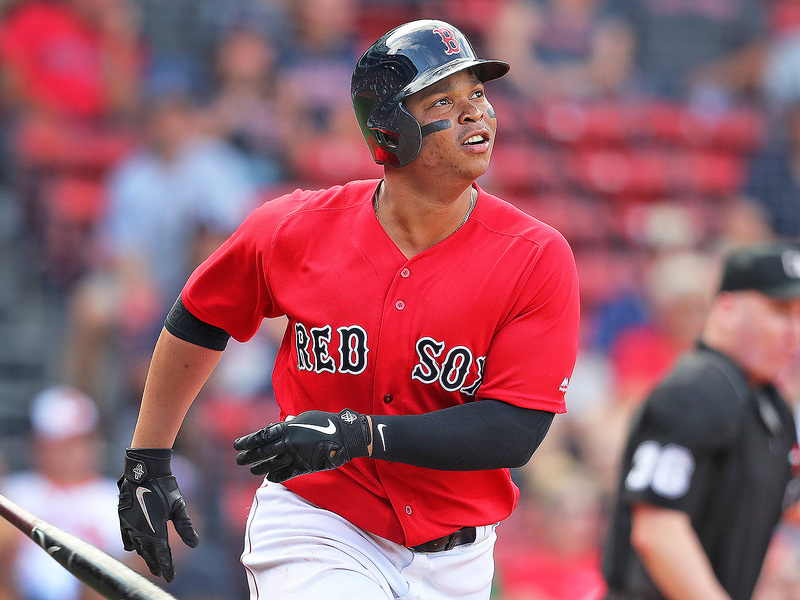 Coming off a terrific rookie debut last year, when he hit .284/.338/.482 with 10 homers in 58 games at 20 years old, Devers took a big step back in his sophomore campaign, falling to .241/.299/.434 amid numerous injuries. His defense, meanwhile, remains a massive work in progress, and best watched with your eyes covered. But he’s a wildly talented hitter with prodigious power, homering five times in 66 September plate appearances, and is the best bet to provide some surprise offense to supplement Boston’s core four. Boston’s bullpen is an uneven lot. Kimbrel and Barnes are trustworthy, but the rest—likely some mix of Ryan Brasier, Joe Kelly, Brandon Workman, Heath Hembree, situational lefty Bobby Poyner, displaced starter Eduardo Rodriguez and knuckleballer Steven Wright—have a real Russian roulette feel to them. Everyone in that group struggles with free passes, too: Red Sox relievers have a walk rate of 9.8% this season, highest among all five AL postseason teams. If those pitchers can’t give Cora clean innings, he’s going to have to lean heavily on Sale, Price and the rest of the rotation to make up for it. Betts is a supernova—the kind of young, personable, marketable star that MLB executives have long tried and failed to create in a lab. And his style of play is joyous and boundless, blessed as he is with quick wrists, prodigious power, excellent speed, and brilliant defensive instincts. He’s the best non-Mike Trout player in baseball, and he’s appointment viewing this October. Let’s be honest: You don’t need me to give you reasons to boo the Red Sox. Most people will enter the postseason with preexisting Boston hate fully formed and operational. But as the nominal favorite thanks to their league-leading win total and as the owners of three championships since 2004, the super-wealthy Sox are far from being a feel-good underdog story. They’re as much of a Big Bad as the Dodgers or Yankees; cheering for them is like pulling for Goldman Sachs to get another tax cut. With 108 wins, the 2018 Red Sox displaced the 1912 edition for the most in franchise history. Led by Smokey Joe Wood, who won 34 games with a 1.91 ERA in 344 innings, and Hall of Fame outfielder Tris Speaker, who hit .383/.464/.557, that squad won 105 games en route to a pennant and a World Series victory over the New York Giants in the first year of Fenway Park’s existence. Also, there were guys named Hick, Pinch, Heinie, Duffy and Olaf on that team. Old-timey baseball is the best. Matt Damon and Ben Affleck are the ultimate Red Sox townie fans, to the point that they wrote in the 1975 World Series as a plot point in Good Will Hunting, while the latter used Fenway Park as the site of the climactic robbery in his 2010 film The Town.